In December 1903, the Metropolitan Asylums Board (MAB) opened Joyce Green Hospital on farmland midway between Dartford and Long Reach on the Thames. It was one of their River Hospitals built for smallpox and enclosed by a high wooden fence so, as all staff on duty were residents, the atmosphere must have been a cross between a prison and a monastery or nunnery. There were North and South gates; the North giving access to and from the Thames whence came patients by ambulance steamer from London. In epidemics, when hundreds of patients were admitted in one month, recruitment was brisk but not always easy and in 1924 Dr Cameron reported that the reopening of the hospital was proceeding slowly because of the difficulty of obtaining junior nurses. Between epidemics the number of permanent staff was small and at those times the hospital must have had a ghostly silence. In one quarter of 1923 the MS reported that 250 tons of fuel was used by 78 residents, this being the ‘skeleton staff’ required to keep the empty hospital ticking over. Contrast this with a similar period in 1921 when there was a epidemic of scarlet fever and diphtheria, and 1,347 residents consumed 695 tons of fuel. 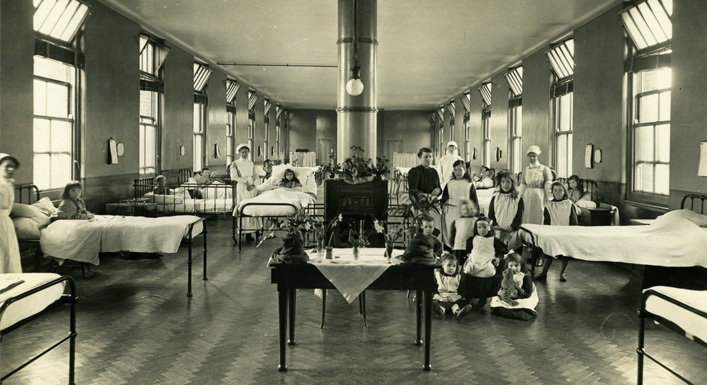 Ward staff were not immune to infection and on 30th November 1921 with 997 patients in the hospital there were 30 staff down with scarlet fever. This seems a lot to us but not a word of what they felt has come down; however they probably took it in their stride for in those days it was accepted that everyone had the usual range of infectious diseases. The immediate death rate of scarlet fever was less than 1%, insignificant compared with killer diseases like smallpox and diphtheria. Also, there was none of the visual revulsion, as with smallpox in the acute stage and the survivors of fevers did not have the terrible legacy of a pockmarked face. There was probably little spare time after twelve hours on duty for recreation, but ward 6a had been set aside for entertainments for patients and staff since 1911. In 1924 Dr Cameron formally requested a recreation building where they could smoke. He told the MAB of ‘the growing practice of smoking amongst female staff who are apt to using their bedrooms for this purpose because there is no other accommodation’. This was provided by the MAB in 1926 so it is surprising that in 1930 three Institution Nurses were dismissed for smoking. Marriage was a bar to continued employment, three staff leaving for that reason in May 1932, but for one maid the authorities did not have a heart of stone, or so we may surmise. Matron Morris reported that Lilian Letchford, Kitchen Assistant Class II, joined the staff on 22.10.30 and did not disclose the fact that she was married, but had left her husband owing to his misconduct. ‘She has three children and states that it was impossible to get a daily post where she could get sufficient money to keep herself and her children’. Matron ended her report by stressing that her conduct was good and her work very satisfactory. Happily, Lilian must have been allowed to stay, her name does not appear in the long lists of departing staff in the ensuing months. With the large number of staff and visitors coming and going it is hard to believe that the rules about being fully vaccinated were not bent. Even so an unauthorised exit ‘over the fence’ still warranted dismissal, though perhaps only when smallpox cases were present, as did ‘receiving a man in her bed room’ as was discreetly said of one maid. The Day Gate Porter had to retire to his bedroom by 10.30pm and was to put out his light by 11pm. His Leave of Absence was 8 hours a week and one day of 24 hours each month!